It's our pleasure to welcome you to Hunters Crossing, one of our premiere apartments in Gainesville, Florida offering one, two and three bedroom apartments with optional dens and garages. We're located next to the Hunters Crossing Shopping Center featuring: grocery and pharmacy shopping, dining & coffee and banking — ALL within walking distance. You're a short drive from I-75 and the city of Alachua via U.S. 441. The Shops at ThorneBrook Village, The Oaks Mall, the University of Florida, Santa Fe College and Gainesville Regional Airport, excellent daycare and schools are all located nearby. 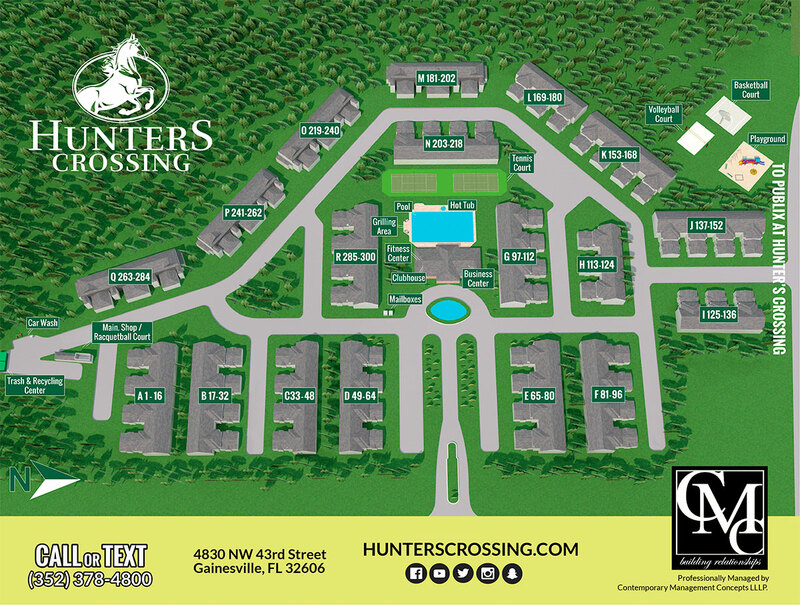 Hunters Crossing offers luxury apartments in Northwest Gainesville. You’ll discover that other apartments Gainesville has to offer can’t compare to the high-quality luxuries found at Hunters Crossing. Our units have 9-foot ceilings with crown molding, all of the necessary appliances, walk-in closets, and the option for gas fireplaces. Residents can also experience the amenities that contribute to our tight-knit community atmosphere, which include a fitness center, BBQ areas, sand volleyball, and a racquetball court. Whether you're looking for a beautiful new home or are in need of a corporate rental unit, you can't go wrong with Hunters Crossing. See your future apartment home in photos, including our common areas, exterior views, and coveted amenities. Located minutes from I-75 and US 441, the pet-friendly Gainesville apartments at Hunters Crossing are ideal for commuting to work. Residents have easy access to all of life’s necessities because we are also within walking distance of plenty of restaurants, shops, cafés, and grocery stores.